We offer to purchase an elegant private house in resort city Jurmala, in Bulduri. 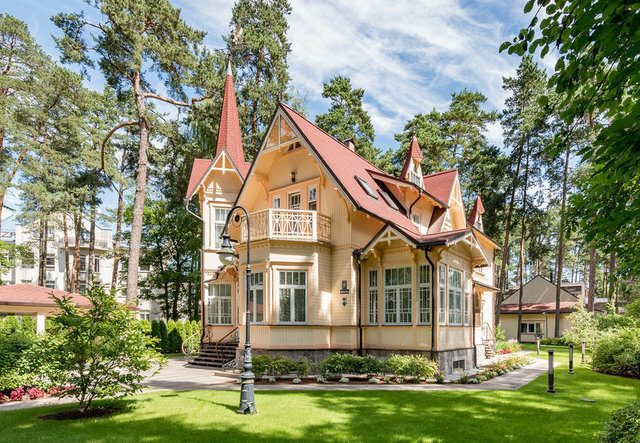 The bright and spacious house is an outstanding example of Jurmala’s wooden architecture. The house has been fully renovated as it was built in 1910. During the renovation only high quality and nature friendly materials have been used. House has practical and well thought out planning, with all necessary facilities. On the first floor is located cozy living room with fireplace, dining room, kitchen, office room, guest bedroom, guest bathroom and toilet. On the second floor you will find master bedroom with terrace and separate dressing room and bathroom, two bedrooms, each with its own bathroom. The house has a -1 floor as well, with spa area inclusive sauna, whirlpool bath, shower room, a gym, lounge area, bathroom, utility and laundry room. In the landscaped and green yard is tea house with kitchen and a spacious lounge. For security purposes security cameras and alarm system installed on the territory. This is great opportunity to buy a well-equipped and ready-to-move in private house in Jurmala. Nearby is a supermarket, water park, tennis courts, a marina, public transport. Baltic Sea is just few minutes’ walk away.